Great Northeastern War (more commonly known as GNEW or GNE), is a four day event held every year in July in the Province of Malagentia. 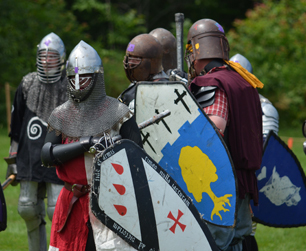 Regarded by some as a "Little Pennsic", this event has all the activites of its much larger cousin; Field battles, Rapier combat, Archery, Siege Weapons, The Ball, A&S Classes, High Court, and Shopping. The first Great Northeastern War was held in A.S. 22 and hosted 100 people. This was a war between Seashire and Malagentia and was colloquially known as the Great Northern War, Great Northeastern War, and the War of Kunegunda's Garter. Today, GNEW has doubled in length and has ten times the number of attendees. It is the largest camping event in the north. The story, as it is told today, goes something like this. In the winter of AS XIX, Kunegunda II, Queen of the East, contacted the autocrat of an event called The Third Feast of the Kelpie, hosted by the shire of Seashire, asking if she and some companions could attend. The Autocrat of the event, not understanding who was calling her, turned them away, telling them the feast was full and they were no longer accepting reservations. At the time, Queen Kunegunda had taken as boon companions two young fighters from the shire of Malagentia - Lord (later Sir and Count) Arlof o'Donave, and Lord Malachi Oltherson Veassulrd. Malachi and Arlof, together, swore that they would take vengeance on Seashire for this slight to the Queen. Time passed. One day, a box arrived at the home of Lord Andrew of York, at the time Seneschal of the shire of Seashire. The box contained a number of unusual objects, plus a note (which opened "Seshur wharf rats...") was a declaration of war on Seashire from the Veassllurds household. Volume 1 Issue 3 (2006) of the Aurora Borealis, Lord (now Baron) Andrew recalled "We were a very new Shire, well beyond our next nearest neighbours - Malagentia - with extremely limited knowledge of the ways of the rest of the Known Worlde. We had NO idea of how a declaration of war should be taken, or even who sent it. For all we knew, we could now be in the middle of a serious blood-feud - it was only at the war itself that we realized how much fun these wars could be - and thought that perhaps it really was a dire threat." Some months further on, Lord Deormund (Seneschal of Malagentia) got in touch with Lord Andrew, only having recently learned that a war had been declared. Together, they decided that an event would be held, in Malagentia, with Deormund and Andrew as Co-Autocrats. In due course, the event - called The Great Northern War -- took place, June 19-21, AS XXII. Malagentia won, Randal and Marieke held the first in a long line of Royal Courts at the event, a wedding was celebrated, and a good time was had by all. Over the subsequent 30 years, across four different sites and against wide variety of opponents, Great Northeastern War has continued to thrive, now drawing over 1,000 attendees each year. As the event has grown, what has not changed is our reputation for good fellowship and good fighting. The story of "the little Pennsic of the North" is the story of the growth of Malagentia. This page was last edited on 17 January 2019, at 09:35.